Take a bowl. Add flour, salt, oil and mix it well. Add some water gradually and mix it with flour. Don’t add all the water at a time, otherwise it will become sticky. Add as per the need. Knead into soft dough. Take ¼ teaspoon of oil and grease the dough. Cover it with cloth or bowl and keep it aside for 10-15 minutes. Take dough and divide into 7 balls. Take some dry flour into a bowl. 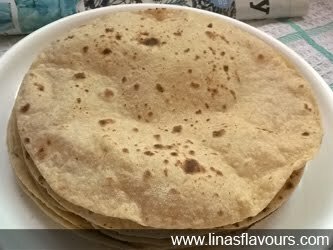 Dip into dry wheat flour and roll the roti on rolling board with rolling pin. Sprinkle some flour on the board also to roll the roti smoothly. Roll it about 4-5 inch diameter. It should not be too thick. Take a tawa/griddle and heat it on the gas stove. Put roti on tawa and cook it on one side till some brown spots appear, only half done. Hold it with a tong and turn it on the other side. Let the other side be cooked properly till brown spots appear but should not be crisp. Again hold it with a tong and put the first half cooked side directly on the flame. Slowly it will puff into a ball. Take it down immediately otherwise it will burn. Put it on the plate. Apply ghee or serve it immediately with vegetable. Same way do all the rotis.